These photos capture the Berlin Ceramics Center in very different weather but nevertheless suffice to show how wonderful a place it is. The Center will surely be just as magical in the snow and chill of late November when their Christmas collection opens this weekend. Work by their summer resident Jacqui Chanarin will be featured, along with lanterns by Regina Müller-Huschke and oil lamps by Katy Jung; I'm sure Kaja and Thomas' elegant cups (adorned with evocative German words and phrases) will also be available. 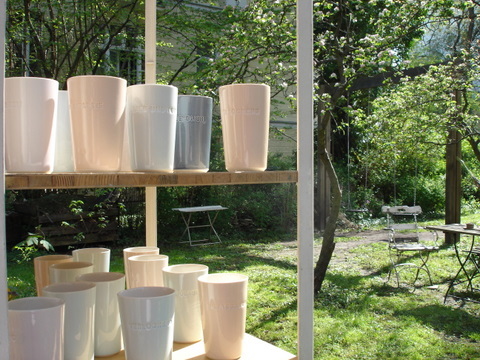 Go along and dream of being one of their talented artists in residence (or indeed, apply for a residency, should you be a ceramics artist looking to spend an idyllic, creative few months in Pankow). The opening is this Saturday from 3-6 pm, and Jacqui will discuss her work at 4. The Zentrum für Keramik is open weekends 2-6 pm from now till Christmas, and is also open Tuesday-Friday 2-5pm. Oh, how I dream of the Madras Palace as I sit in some Himalaya Rani Namaskar joint in Berlin, gamely choking down another over-creamy curry. And how pleasing to be back in that shabby interior, jostling amongst the grandmas at the buffet, spearing an uthapam, ladling out some chana dal payasam, eating to happy excess. Everything's fresh, everything's deeply flavorful, the menu is different each time I come, and nothing on that menu is taken from the Indian Restaurant Generator (palak paneer devotees will have to look elsewhere). After years and years of Berlin, I find the suburban strip mall location merely piquant rather than soul destroying. Note that the lunch buffet is the way to go! The glories of a fresh market! The compass of my world has grown overly small these past few years, and it is good to use the wandering days of early parenthood to seek out some new corners of my beloved city. The Lausitzer Platz organic market provided a crazy kaleidoscoped view of old favourites from Prenzlauer Berg (Gerd, the Persian woman dispensing tea) alongside happy new discoveries (try the deadly Krapfen at the organic crêpe stand ). Go tomorrow, if you can, while the ground is still luxuriant with leaves; meanwhile, I'll be whizzing into the skies, and speaking of which, any tips for the DC area should be emailed to me tout de suite!